Located at the crossroads of Europe and Central Asia, Georgia is a bridge connecting several important economic regions including the EU, Caucasus and Central Asia. It is a key link in the shortest transit route between Western Europe and Central Asia for transportation of oil and gas as well as dry cargo. Georgia's oil and gas pipelines, Black Sea ports, well-developed railway system, together with its airports are playing an increasingly important role in linking East and West. 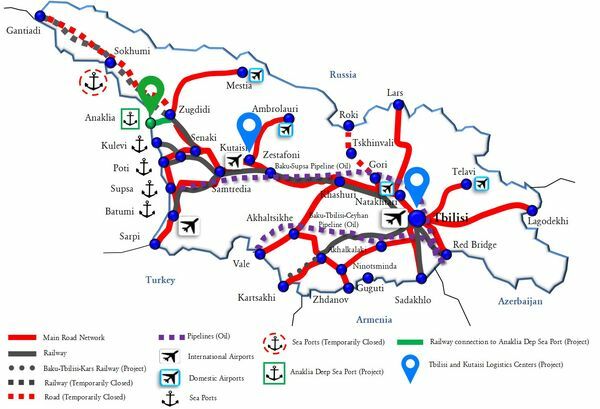 At the same time, Georgia functions as the vertical North-South transportation link between Russia and Turkey and, via Armenia, to Iran.